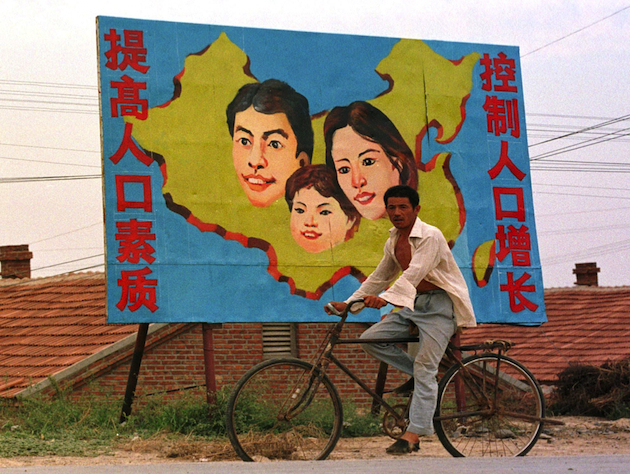 The Chinese government isn't getting rid of its one-child policy currently in place. It's just making it sound better. China's communist party newspaper, People's Daily, reports that the government will revamp its abrasive-sounding slogans surrounding the policy. People's Daily cites several examples of "harsh slogans," including those "which sometimes even threaten criminal acts." The newly instituted program, slugged the "face-washing project," will offer more proactive slogans to help enforce the policy, which has been in place since 1979. China claims the policy, which applies to those living in urban areas, affects approximately 35.9 percent of the population and has resulted in an estimated 400 million fewer births since first being implemented. "If you don't receive the tubal ligation surgery by the deadline, your house will be demolished!" "We would rather scrape your womb than allow you to have a second child!" "Kill all your family members if you don't follow the rule!" "Once you get captured, an immediate tubal ligation will be done; Should you escape, we'll hunt you down; If you attempt a suicide, we'll offer you either the rope or a bottle of poison." The new less offensive slogans replacing the more callous ones will reportedly seek to "avoid offending the public and stoking social tensions." China's one-child policy has faced criticism from around the world. In addition to more obvious concerns about civil liberties, the policy has reportedly had the unintended effect of many families aborting female babies until a male child is conceived. That trend has resulted in 118 boys being born for every 100 girls, which has contributed to males outnumbering females in China by an estimated 30 to 40 million. China is also bracing itself for an unprecedented growth in its senior population over the next several decades. As of today, people over the age of 60 make up only 13 percent of China's population. But that percentage is expected to swell to over 30 percent by 2050. "Caring for the girl means caring for the future of the nation." "Please get rid of the alcohol and cigarettes before you plan to be a father."